Happy New Year to all of our readers! 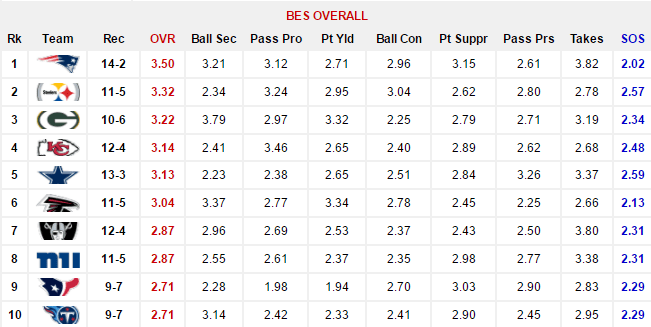 Those of you who have been following the BES rankings know that the accuracy of our data has held strong over the last seven weeks. 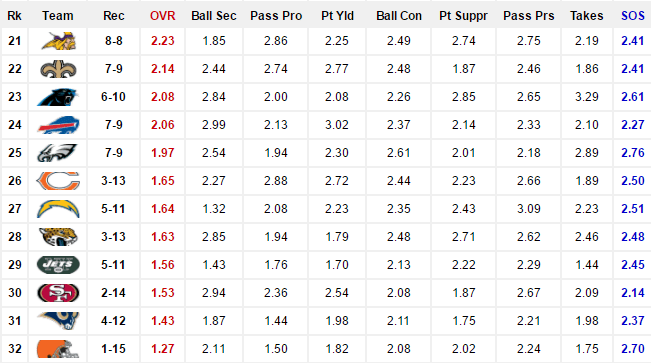 Our Week 16 report was 12-4 (.750) predicting winners in Week 17 based strictly on its rankings. That gives the BES a tally of 77-32 (.706) over the final seven weeks of the season. 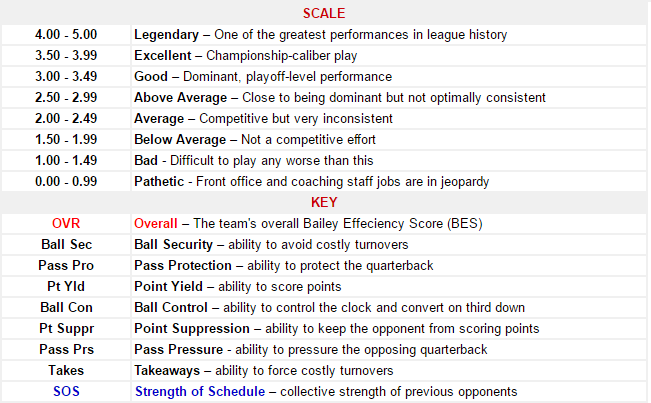 Last offseason we made some additions and adjustments under the hood of the BES rankings with the intent of achieving more accurate data, especially in terms of our final report. It appears we’ve achieved that goal. All of the division champions are among the BES Top-10 with the exception of the Seahawks (10-5-1) who landed at No. 12. Also, every playoff team finished among the top-15, including the Lions (9-7) who close at No. 15 despite riding a three-game losing streak into the playoffs. The Patriots (14-2) finished with the best record in the NFL, clinched home field advantage throughout the AFC playoffs and are rightfully ranked atop the BES. Their BES Overall score of 3.50 is up +.14 points from last week, an indication they’re still gaining momentum as they enter the postseason. They also boast the No. 1 BES Defense and No. 3 BES Offense making any January visit to Foxborough a daunting and intimidating one. Elsewhere in the AFC playoff landscape, we find the Steelers (11-5) and Chiefs (12-4) ranked No. 2 and No. 4 respectively this week. Those two teams are gathering momentum of their own and arguably pose the greatest threat to the Patriots hopes of reaching their seventh Super Bowl in 16 seasons. The Chiefs have made steady strides down the stretch to improve on both sides of the ball, particularly on offense. 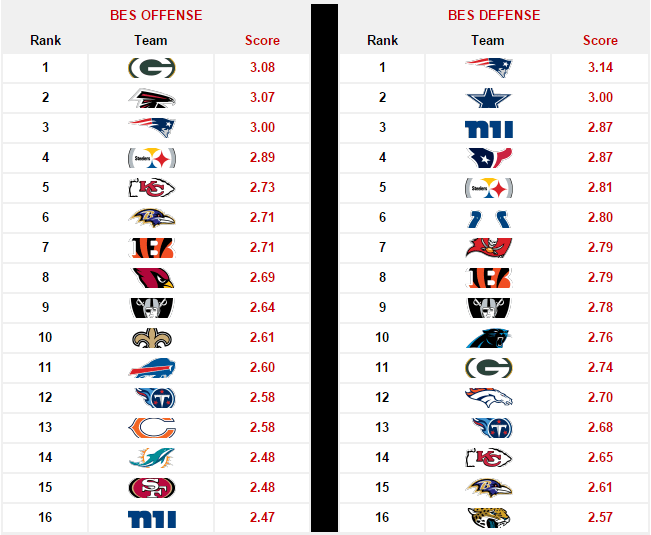 They end the season ranked No.5 in BES Offense with a score of 2.73, up 15 spots and +.33 points from our Week 14 report. Contributing to that is a Pass Protection score of 3.46 that tops the other 31 teams. Meanwhile, the Steelers finished 4th in BES Offense, 5th in BES Defense and will host the Dolphins (10-6) in the wildcard round. 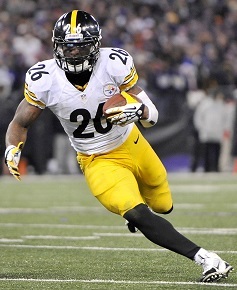 Steelers All-Pro halfback LeVeon Bell fuels the team’s league-leading Ball Control score of 3.04, a key strength against the Dolphins score of 2.11. 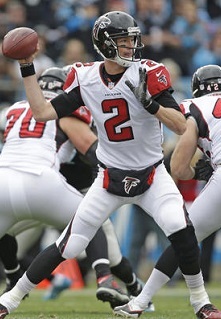 The Packers (10-6) and Falcons (11-5) are the hottest teams entering the NFC playoffs and feature the No. 1 and No. 2 BES Offenses respectively. Both teams are led by MVP-worthy candidates at quarterback armed with a plethora of versatile weapons. 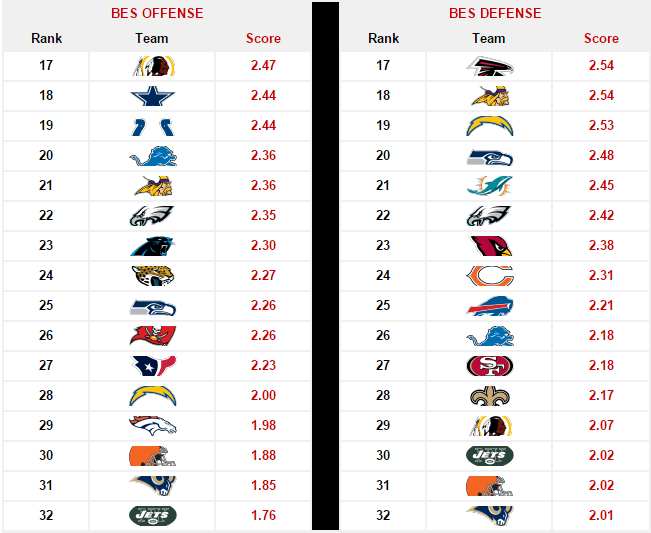 However, the Packers are the more balanced of the two with a defense ranked 11th by the BES. The Titans (9-7) are the only non-playoff team to finish among the BES Top-10 which might seem surprising to some. However, they own regular season wins over the Chiefs, Packers, Texans and Dolphins – four playoff combatants. They also won five of their final seven games. I’m starting to hear how hot they are…The word is The Chiefs are Ballin! Which means they aren’t only just winning, they are dominating in every aspect both sides of the ball. Love you for this man! Patriots should win. Way more Super Bowl experience than the Falcons, good defense and good running game. You think pats d is better than the falcons? Or I’m the only who’s saying that our defense is SUPER underrated?